Madagascar hissing cockroaches (Gromphadorhina portentosa) are sizable insects that, as their common monikers show, come from the African island country of Madagascar. They are not naturally found anywhere else on Earth. 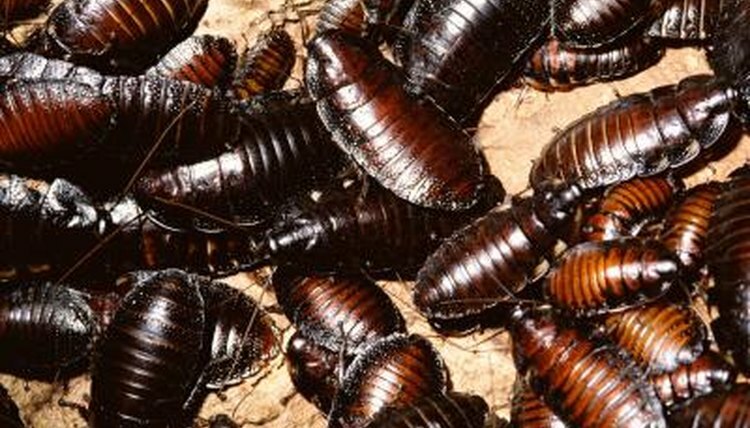 Madagascar hissing cockroaches can reproduce at any point in the year, as they don't have a set breeding season. However, the weather must always be adequately warm for reproduction. These glossy cockroaches grow to anywhere between 2 and 3 inches in length, with weights of no more than 0.8 ounces. They do not have wings, although the males have big horns in the backs of their heads. Madagascar hissing cockroaches live in rainforests, where they feed on fruit, tiny bugs, fungi, rotting plants and leaves. They sometimes even dine on carrion. As far as hissing goes, they do so for a variety of different reasons, including sending out warning signals and self-protection. They can be fierce in nature, but not usually to youngsters or females. These roaches employ their famous hisses as a means of wooing females for mating. They hiss by expelling air via tiny external openings on their stomachs, or spiracles. Although the males hiss to draw in females, the females lure in the males by emitting an odor. Along with hissing, the males of this species also express their interest in mating by rubbing a female's antennas. The females frequently stroke the males' antennas in return. Madagascar hissing cockroaches officially commence the act of mating by rubbing their bodies together. They then connect their bodies, backside to backside. The males initiate this by pressing their stomachs below the females' physiques as a way of gaining access to their lower bellies. They lock into this stance for roughly half an hour or so. After mating, "mother-to-be" Madagascar hissing cockroaches place the eggs that are fertilized inside of ooethecas, which are foam containers. Oothecas are usually around an inch in length. It takes roughly 60 to 70 days for the youngsters to hatch. One interesting aspect of Madagascar hissing cockroach reproduction is the females, to some degree, bear live young, as they are ovoviviparous. This means that egg hatching takes place internally, instead of outside of their bodies. Oothecas usually house anywhere between 20 and 60 nymphs. Once these nymphs are born, it takes them approximately seven months to become fully mature. The tiny nymphs enter the world with flattened appearances and are usually around 0.25 to 0.5 inches long. They start out white, but as they get older, gradually turn browner. The mothers look after them until they attain maturity.